Hordes of rats are brazenly taking over homes inside a New York City public housing building, stomach-turning video shows, and even worse, may have bitten a baby Monday morning. Tenants at NYCHA's Claremont Rehab in the Bronx say the giants rats have been taking over their apartments after a basement garbage compactor was shut down last week, driving the rats upward. 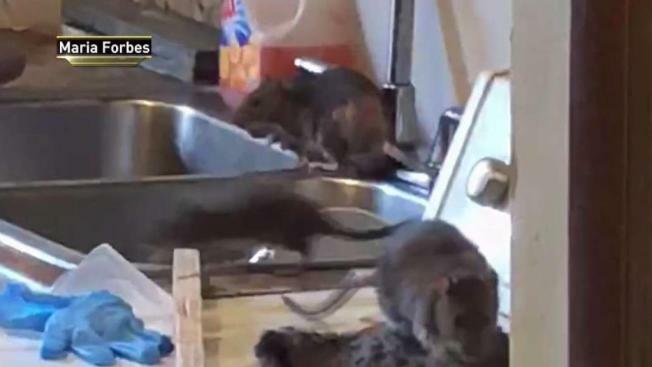 One video taken last week shows a group of rats popping out from behind a washing machine and scampering across the kitchen sink, one right after another. The family in that apartment boarded up the kitchen, fearful the rats would attack their dog. Another tenant showed video of two drowned rats in his toilet. "We're getting tired of this every day -- look, wake up and we see rats, not even mice, in our toilets," he says. "It's disgusting. We pay rent every month on time, and this is why we pay rent for?" Worst of all, Asia Clemente said she found a rat biting her 1-year-old son's stomach while the child was sleeping Monday morning, and showed photos of the bloody wound. She took her son to the hospital, where he was placed on antibiotics. "Every mother's worst nightmare when you have a child, especially a sick one,' she said. "You can't do nothing, you helpless." Clemente thinks the rat was gnawing at the feeding tube attached to baby Daniel's stomach. She said it was the second time that the boy, who suffers from multiples health conditions, has been bitten by a rat. She's worried now that the rats will chew through her son's oxygen tube: "My son's not getting no air" if that happens. Clemente said she can't leave because the family was already transferred once this year. They arrived at Claremont to escape rats in another NYCHA building. NYCHA tenant leader Daniel Barber said Con Edison workers won't even go into the basement because the rat infestation was so bad. In a statement, NYCHA spokesman Michael Giardina said, "Our residents should not have to live in these conditions. Since this first came to our attention, we have taken aggressive steps to address the current infestation by eliminating rodent access to the building and the apartments, which will also keep future rodents away. We apologize to our residents and will continue to vigilantly monitor this situation." NYCHA says staff have been stationed at the building throughout the weekend to inspect and address the conditions, and are plastering walls to block any passageways for rats to get in. Exterminators are also treating the basements, and four compactor rooms have been closed while work is being done down there, NYCHA says.